I was at a paper craft session at the Galt Library last Saturday. I do some scrap booking but it is one of my neglected hobbies. 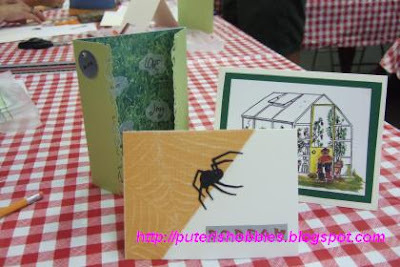 Making cards is a bit like scrap booking because the materials you use in scrap booking are the same ones you use in card making. Other than recycling old Christmas cards and pasting them onto new cards, I have never made any creative cards. The paper craft class at the library was free and I signed up for the class quite some time ago. The lady who taught was an English lady. Her husband was there to assist her. There were ten ladies and one guy in the class. It was a fun class and not at all complicated. We made three cards and here are the cards I made. 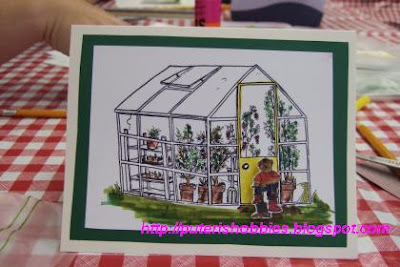 well sista, u're purely genetically artistic, u've given me ideas to make some cards... maybe i will pile into the Xmas cards junkies in the box.. hmmmm.... will try!